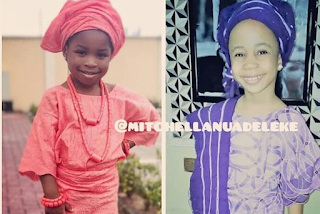 Controversial journalist Kemi Olunloyo blast Davido after she shared photos of his daughter, Imade and alleged first daughter, Mitchell. She said they are two different girls, Now no surname Amanda is hearing her daughter is not Davido's second child and advises she may shift to #3. #HNNGossip Two different girls. The media has labelled Imade Davido's first Daughter. These are errors created by the father who refuses to properly establish paternity. Now no surname Amanda is hearing her daughter is not Davido's second child�� and she may shift to #3. Aren't you glad this is not a direct monarchy? Greet Imade for me o!!! !